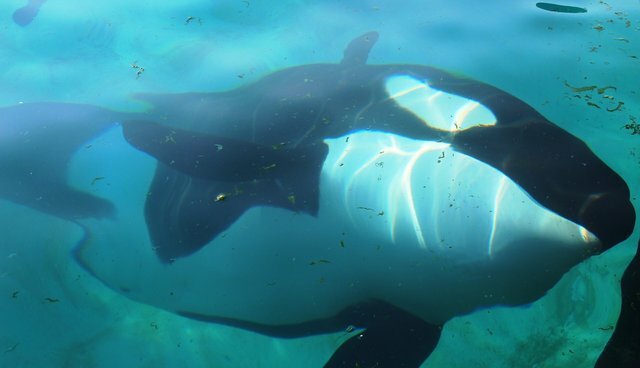 Recent flooding in the south of France has led to extensive damage at Marineland Antibes, a captive entertainment facility holding five orcas, fourteen bottlenose dolphins and numerous other marine species. According to Bernard Gianpaolo, director of Marineland Antibes, 90 percent of the facility's technical amenities have been compromised, which is fundamental to the care and maintenance of the facility's animals. Many of the animals' tanks are also now filled with mud. "There is an immediate concern for the cetaceans [whales and dolphins] being left to swim in the dirty water. Any bacteria contained in the sludge can potentially cause gastrointestinal upsets and respiratory infections. There could also be irritation to the eyes, mouth and other sensitive parts of the body. It is vital that the animals be monitored for any of these ailments and it is imperative they be moved to clean water as soon as possible." "Marineland Antibes should be able to confirm its plans as a matter of urgency. If it isn't able to do this, then the question must be asked why." "Marineland Antibes has said it is doing everything it can so that the animals can go back to a normal life and that this is the facility's priority." "There is nothing normal about whales and dolphins living in very confined spaces, performing tricks for entertainment in shows. It is high time France becomes dolphinaria-free. Our country should not be the last in Europe to take this ethical step." This isn't the first time this year that Marineland Antibes has fallen under public scrutiny. In June 2015, the facility's last remaining wild-caught orca, known as Freya, died following a long, unidentified illness. Freya was captured from Iceland in 1982 and was almost two decades shy of the average age that female orcas are expected to live in the wild. "This open letter is a response from over twenty international organizations to the false arguments and wrong scientific approximations put forward by Marineland Antibes. The Dolphinaria-Free Europe coalition wants to prevent this facility from publishing misinformation about the capture of wild whales and dolphins and from taking credit for participating in the conservation of the species that they display for profit. Captivity is not conservation." "We [the Dolphinaria-Free Europe coalition] ask Marineland Antibes for full transparency on the consequences for the animals at its facility and the plan it has in place to address this issue." In the meantime, Marineland Antibes' doors remain closed to the general public while it attempts to resolve this horrific situation.